(Bloomberg Opinion) -- When it comes to stock ticker symbols, John Malone’s a collector. Years of his intricate dealmaking – tailored to minimize tax payments – spawned a bewildering array of tracking stocks and various classes of shares that own businesses spanning media (Discovery Inc.), entertainment (Sirius XM Holdings Inc.), sports (Atlanta Braves) and much more. But Malone, now in the twilight of his career, may be moving toward simplifying his notoriously complex holdings structure, starting with Expedia Group Inc.
Expedia, the online-travel company, said on Tuesday that it will buy out Malone’s Liberty Expedia (tickers LEXEA and LEXEB) in an all-stock transaction valued at $2.6 billion. 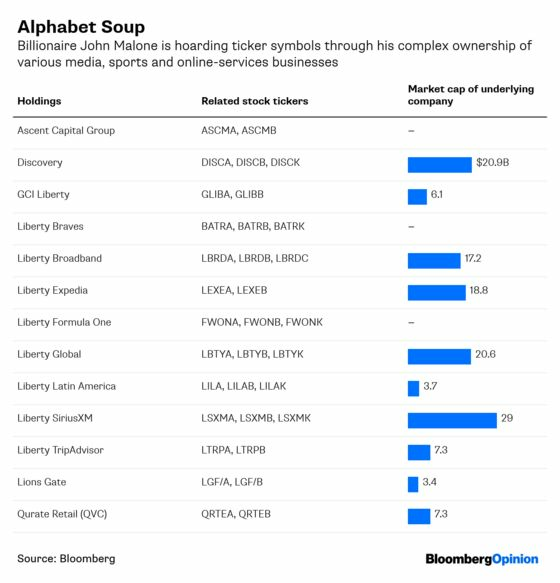 (Most of Malone’s holdings are coined Liberty Something, in case you were wondering.) It’s essentially a housekeeping deal between two billionaire frenemies – Malone and Barry Diller, the chairman of Expedia – who share a long and at times entertaining history. Shares of Expedia rose 2 percent in early trading, its valuation already benefiting from the idea of having a less convoluted ownership. The move could even herald more deals like it from Malone, who turned 78 last month. I wouldn’t be surprised if we soon see more action on the Liberty front to tidy up his holdings and sell where there are eager buyers. Both Discovery and Lions Gate stand out as prospects, as do Liberty TripAdvisor, the tracking stock for TripAdvisor Inc., and Liberty Latin America. Malone’s spring cleaning with Liberty Expedia may be the start of untangling his ticker tape.